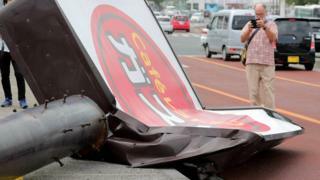 A powerful typhoon is battering Japan, causing widespread travel disruption. Typhoon Trami made landfall on Sunday at 20:00 local time (11:00 GMT) near the western city of Osaka, with gusts of up to 216 km/h (134 mph). Many flights and trains services were cancelled as the storm moved eastward. More than 750,000 homes lost power. At least 84 people suffered minor injuries. The typhoon comes less than a month after the country’s strongest storm in 25 years hit western Japan. Typhoon Jebi caused widespread flooding at least seven deaths in early September.